Our Children’s Brazilian Jiu Jitsu Program at GB Jupiter was created to provide an environment that allows your child to experience and understand core values around focus, discipline, persistence, cooperation and respect – all through the principles of BJJ teachings. • Juniors & Teens (10-14 years old). How will my child benefit from attending Kid's Martial Arts in Jupiter, and what will they learn through our Brazilian Jiu-Jitsu curriculum? Try our Martial Arts Program in Jupiter and see for yourself. What are the principal qualities of a great fighter? What does it take for an ordinary person to realize his or her own potential through martial arts? Gracie Barra’s GB1 Fundamentals Program is tailored for the beginner Jiu-Jitsu practitioner. Our martial arts program in Jupiter uses self-defense and jiujitsu to build a solid foundation for our Brazilian jiujitsu program which will focus on the essential jiujitsu techniques and concepts. The GB 1 Fundamental Class is built for both old and new practitioners, weather you are a white belt learning the core techniques for the first time, or a higher rank looking to understand the basics from a different point of view. The fundamentals program will take you to the next level in a systematic and proven martial arts curriculum. Its structure condenses an immense diversity of Brazilian jiu-jitsu into core fundamental moves combined intelligently and safely to optimize your learning. We will outline exactly what is needed to progress from white to blue belt in our academy. Advanced Program classes are based on a defined class structure and curriculum that take a broad and open-minded approach, incorporating techniques from different grappling styles like Wrestling, Judo, Sambo, and, of course, Gracie Barra Brazilian Jiu-Jitsu. This is where you will begin No-gi training as well. 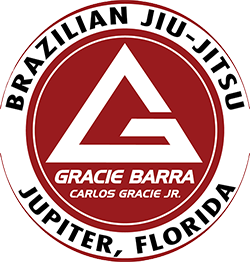 What to expect on my first martial arts class at Gracie Barra Jupiter? Aside from all classes offered in the Adults Gracie Barra Program Structure, our school offers a set of classes designed to introduce women to the art of Brazilian Jiu-Jitsu by introducing Women’s Self Defense in Jupiter, Florida. 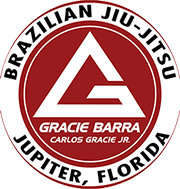 The Gracie Barra Women’s Self Defense Program in Jupiter combines a comprehensive self-defense curriculum with emphasis on drills that simulate realistic attack and escape situations. Barra Fit is a new, specialized Brazilian Jiu-Jitsu Fitness class offered through Gracie Barra Long Island that draws on the training methods of GB with the exception of the belt system, to build a martial arts inspired fitness program. Barra Fit incorporates the philosophy, teaching and training methods of Brazilian Jiu-Jitsu into classes that are specifically designed to help individuals meet their fitness goals. However, Barra Fit is more than just a workout. It is a fitness program built with the same components that make the Gracie Barra Long Island training experience so unique, inspiring, welcoming, challenging and safe. The Barra Fit program goes beyond the typical “get into shape” aspiration. The program aims at building a strong mind as the foundation for a strong and fit body by teaching the same values we teach to regular Jiu-Jitsu practitioners to help them succeed on their journeys from white to black belt. Barra Fit is fitness with a purpose. The purpose of achieving one’s personal best.